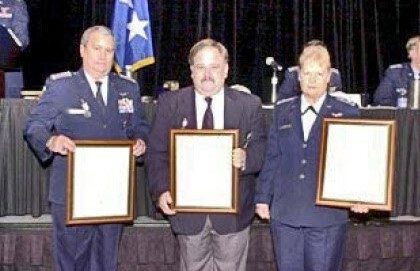 CAP HEROES – “so that others may live” – Silver Medal of Valor Recipients: Maj Gen Tony Pineda, National Commander, Col Dan Levitch, FL Wing Commander and Col Eileen Parker, FL Wing Vice Commander, received the Silver Medal of Valor. This award is the highest honor that is presented within the Civil Air Patrol. Each received this special award because they risked their life in order to save others when they came upon an automobile accident while returning from National Headquarters. Gen Pineda assumed the duty of directing traffic and oversight of the accident. Because of the imminent danger to the trapped occupants and leaking fuel, Col Levitch climbed through a window to assess the injuries of the four passengers, extricated them from their seat belts and passed them through a small window. Col Parker laid the victims down away from the vehicle, aided and consoled them. Tony Pineda gave himself the Silver Medal of Valor, for a traffic accident that an investigation determined never actually happened. He pushed it through the Awards Committee along with those for Levitch and Parker. Look at the photo and see how uncomfortable with all this nonsense Levitch appears. Eileen Parker doesn’t look happy either. On August 4th 2017, Skip Munger provided AuxBeacon with his statement on the abuses of Civil Air Patrol National Commander Tony Pineda. Later on in the investigation, one OSI agent told me, “You know, someday this Pineda guy is going to be the CAP’s national commander, and there’s nothing we can do to stop it.” To this day, I think because at the time Pineda was a special agent of the Florida Department of Law Enforcement (FDLE) he was probably tipped off about the FBI and the OSI efforts and that’s why he hid everything from them, but I could never prove that. 3 Comments on "Silver Medal of Valor Frauds"
This explains so much of the behavior I have seen in the Southeast Region. Tony Pineda gave himself the Silver Medal of Valor for a traffic accident that investigation determined never actually happened. He pushed it through the Awards Committee… along with those for Levitch and Parker. If you look at the photo, you can read how uncomfortable Levitch and Parker appear. Pineda was ruthless and making a public scene would have been unwise. The medals were rescinded, Pineda was eventually removed and his two victims were forgiven. The staging of incidents for Silver Medals of Valor is, as your current story shows, a common Jedi Mind Trick in Civil Air Patrol. Most of them sit on top of inflated citations over trivial events.